Last night, with the older children at soccer and the younger ones safely at Camp Grandparents, I took a break from my manic baking efforts (I'm helping a friend with her son's rehearsal dinner this Friday) to grab a quiet dinner with my husband. As we enjoyed our sushi and contemplated the latest in our world gone mad (what to do about the unsold house in Phoenix, the ever-present school decision, my grandparents' latest round of bad behavior, our ten hour road trip the next day) a woman leaving the restaurant stopped and touched me on the shoulder. "Excuse me. I just wanted to tell you that you look absolutely beautiful." "Um, thank you", I stammered, taking a mental inventory of my buzz cut, the loose, sloppy clothing I had worn for an MRI that day, and the hasty dabs of makeup thrown on when I realized, yes, my husband and I were really going out. On a date. Maybe she was a fellow survivor. Maybe she was just being nice. Maybe she was following the gentle prodding of the Holy Spirit. In any case, I was thankful for her kindness, and admiring of her courage to speak up. I'm not too sure that I'm beautiful (at least by the standards of the world)...and I've never been good at accepting compliments. But in that one moment I was--and so was she. Thanks to Sally for the quiz tip-off...being my BFF, you know she's a chocolate gal, too! Having breakfast with your favorite fuzzy buddies! Kat, the sweetheart over at justabeachkat tagged me for a restraunt meme. This is actually pretty tough for me, as we've only been living in this area (the border of Orlando/Kissimmee) since January, and for large portions of that time, my white blood cell count has limited us going out, but I'll name a few of the places we've visited and enjoyed so far. 1. The Orlando Snack Cafe is a tiny (less than 20 seat) shop less than a mile up the road in Hunter's Creek. It serves yummy and very authentic Venezuelan food. So authentic, in fact, that it's easier to order in Spanish than in English. The kids love the empanadas and batitdos (fruit shakes) and ask to go here often. 2. Marios Pollos a la Braza has a little bit of everything--seafood, Cuban specialities, arroz con pollo. It's a bit pricey but worth if for the delicious food and noisy family ambiance. Similar to the Snack Cafe, the time we ate here we were the palest people in the place, and probably the only native English speakers. We didn't really think about it until the strolling musicians came into the dining room. Every other table got a lovely song in Spanish. They took one look at us and launched into an instrumental! 3. Rossi's Pizza was introduced to us by my college friend, Heather. (She grew up in this area and now lives on the other side of town.) It's my opinion that everyone should have a fabulous local pizza place to enjoy, and Rossi's is worth skipping the convenience of online ordering/delivery. The kids love the bread sticks there, and I like the whole wheat crust options and their specialty pizzas (taco, cheeseburger, BBQ chicken...). 4. Shisho Sushi is in a bit of a hole-in-the-wall location at the strip mall next to our Home Depot. We had ordered take-away from them before but dined in for the first time on our anniversary. We were pleasantly surprised by the dining room (but I could really do without a TV in any dining establishment) and the presentation of the food, especially our appetizers, was beautiful. 5. Sonny's BBQ is a regional chain, so it doesn't really count as local, but my dh missed his southern BBQ so much when we lived in Arizona that we'd try to hit a Sonny's every time we came back east to visit. Now we have one not too far away, and the family is lovin' it. As for my award, it is called The Blogger Reflection Award. Why? The reason for the title is because this award should make you reflect on five bloggers who have been an encouragement, a source of love, impacted you in some way, and have been a Godly example to you. Five Bloggers who when you reflect on them you get a sense of pride and joy... of knowing them and being blessed by them. This award is for the best-of-the-best so consider who you pick, carefully. This award should not be given to just anyone. If you're going to do the award don't just write a few words and slap it on your blog. Write real thoughts about these bloggers and what they've been to you, and if the bloggers you pick have already been given the award, don't be afraid to give to them again. They deserve it as many times as it's given. The Team Sarcmoa 2007 project takes place this month. You can find events taking place near you here. We'll be on Clearwater Beach next weekend--any donations are welcome! 1. Vehicle choices are pretty limited. My brain thinks I'm a Prius kind of gal, but it's a minivan or SUV for us (actually, we have both right now). 2. One change of clothing for all of us, on any given day, is at least one load of laundry. 4. In reference to #'s 2 and 3, I never thought I would experience appliance lust...but, oh my, the thought of TWO washers and dryers (super capacity, front loading, in one of those pretty designer colors...). 5. Six people can eat a lot of food. Especially when two of them are in training. 6. The more children you have in any given photograph, the more difficult it is to get them all looking at, and smiling at the camera at the same time. 7. I never thought about my brain's amazing capacity for trivia--I can recite from memory a huge selection of children's books ("On Monday, he ate through one apple, but he was still hungry..."), name all of the Sesame Street crew and the American Girls, or give you the back story on the Star Wars series and Bionicle saga. 9. Despite a medical background, I never thought I'd take such personal interest in body products. 10. I never thought about being humbled and awed to the point of tears as I listened to a child first profess faith in Christ. 11. I never thought about the pride and wonderment I'd feel as they grow through their successes and failures. 12. I never really thought about the grace I am apportioned daily. With every child (and every day), I am amazed anew. 13. I never thought about how a heart could grow and expand to love just one more. For those of you who enjoyed Amy's first novel, here's a sneak peek at the second in the series. Pastor's Wife: How are you adjusting to Orlando so far? PW: What do you mean, "all things considered"? Me: Well, I've spent a lot of time in chemo since I've been here. Me: Only if they're in boot camp or making radical political statements! Nurse: I LOVE your haircut. 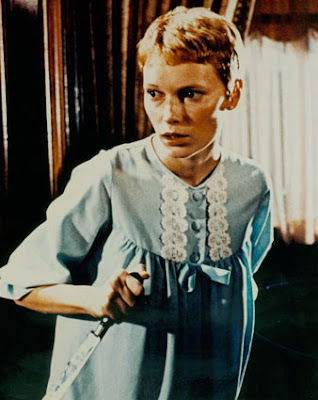 Nurse: I had really short hair in nursing school...you know, like Mia Farrow. Me: Um, I think Mia still had about two inches on me...this is more "Coiffure by Cancer"! Edited to add: Yep, I pulled Mia up on Google images. I'm thankful for what I have back so far, but I'll be even MORE thankful when I have as much as her in that shot!). My daughter has also kindly compared my 'do to Jamie Lee Curtis...and I have a LONG way to go to hit her trademark pixie cut, too! We moved around quite a bit while I was growing up. Each time we moved, we would tease my mother mercilessly for toting with us the Jenny Lind crib that had housed my two younger sisters (I was born during the student years and slept in a port-a-crib). I'm not sure what move inspired her to get rid of it, but I know she didn't let go of it for at least another decade. We decided that our crib need to go on Friday after dh found our monkey, er, youngest son balanced precariously on the the top rail, singing at the top of his lungs. As Providence would have it, that night I went to visit a friend who just happened to have a sweet toddler bed sitting in her living room waiting for a new home. We negotiated a price (dinner at Tijuana Flats and I'd throw in her stamp club fee) and I tossed it into the van. Saturday morning the crib came down and the "big boy bed" went up, complete with Elmo bedding selected by the monkey himself. (Aside: what is it about fourth children? I hate branded nurseries/rooms and would have never allowed this with the other kids...). I cried. Mostly because every other time we put the crib away, it was to wait for someone else to sleep in it. I cried because it had held all my babies, and putting it away signaled the end of a season of our lives, and because I really don't see myself crying over the end of diapers! We talked about donating to Goodwill (there was a load from the garage going that day anyway) or to the Crisis Pregnancy center. In the end I called my mom and apologized for teasing her all those years ago. She laughed...and told us we could store the crib at her house until we were ready to let go it.